that the photos be provided at a distance (margin) and that wraps the text around the images around. 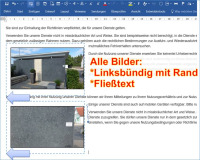 All images on the type shape be changed to do this in Word vba macro and the text is assigned to the setting wdWrapSquare. Then, distance adjusts the distance as margin.